Carpet Tiles was originally established in 1917. With carpet tiles being one of the best in the industry they quickly became one of our best sellers. Being a market leader in supplying carpet tiles to the UK. We can supply most ranges and styles within 3 working days. We offer free delivery for orders over £375+vat available to most UK destinations. Manufacture quality carpet tile flooring for both commercial and public sectors. Their comprehensive ranges match both performance criteria and aesthetics to budgets. 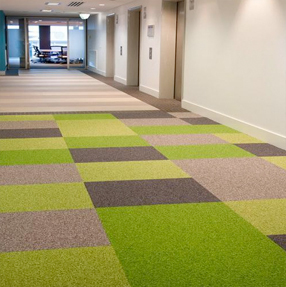 With a comprehensive and strong product range, Burmatex, Forbo, Gradus and Interface offer carpet tile products suited to a wide range of situations and environments. Quality is assured through their BS EN ISO 9002 registration. The delivery service offered is quick and efficient with most orders processed next working day for efficient delivery.